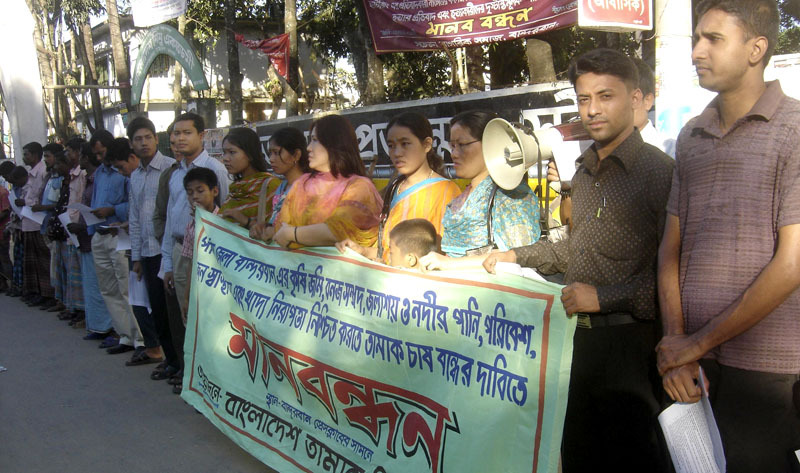 A human chain was organized to demand an end to tobacco cultivation in the Bandarban in front of Zilla Press Club on 9 November. The demand was made by the Bangladesh Anti-Tobacco Alliance (BATA) . Tobacco cultivation is posing a threat to the public health and the environment in Chittagong Hill Tracts (CHT). Thousand metric tones of firewood are being burnt in tobacco processing furnaces every year, causing depletion of reserve and natural forests, threatening environment and ecology in the hills, the tobacco root badly affects fertility of soil, speakers said at the program.